Florence Crittenton Services is the leading advocate for teen families in Colorado. Through decades of experience working with teen mothers, young dads, and their children, we have developed a nationally recognized two-generation program that serves as a model for other service providers across the state and beyond. We have worked for years on strengthening public awareness around the issues affecting teen families, and advocating for programs and policies that help them succeed. In 2014, Florence Crittenton Services was instrumental in establishing the Colorado Teen Parent Collaborative (TPC), a statewide group of organizations that raise public awareness, share resources, and advocate for public policy that benefits teen parents and their children. 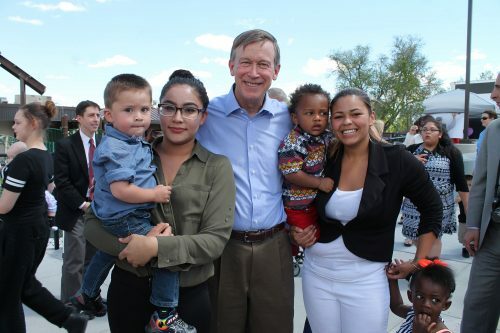 In 2016, together with the TPC, we led the proposal and successful passing of Colorado HB 16-1227, which helps teen parents and survivors of domestic violence to more easily access CCCAP support.The Colorado Child Care Assistance Program (CCCAP) provides low-income families with access to child care so they can get into the workforce, off government assistance, and on the path to self-sufficiency. CCCAP helps two generations break the cycle of poverty by giving parents the opportunity to get the education and training they need to find employment, while also providing access to an early childhood education for their children which sets them up for success in kindergarten. Funding sources for CCCAP include a mixture of federal, state, and county dollars, and parent fees set by the state on a sliding scale. CCCAP funds are made available only for specific purposes, including education, training or other activities that facilitate participation or re-entry into the workforce. The program is administered through county departments of human services under the direction of the Colorado Department of Human Services. Counties set eligibility requirements for families. Prior to the passage of HB 16-1227, in most Colorado, counties, a teen mother or a domestic violence survivor was required to take the baby’s biological father to court or obtain administrative action for child support before they could access CCCAP assistance. This requirement was an insurmountable barrier for many teen mothers and domestic violence survivors, many of whom live in unstable situations and lack the skills and self-confidence necessary to comply. This requirement often made CCCAP inaccessible to teen mothers and domestic abuse survivors at a critical time in their lives, when they were working to achieve self-sufficiency. During the Colorado 2016 General Assembly, Florence Crittenton Services spearheaded efforts to propose HB 16-1227: “Colorado Child Care Assistance Program, Eligibility Criteria for Teen Parents and Domestic Violence Survivors.” Together with partners in the Colorado Children’s Campaign, Mile High United Way, The Women’s Foundation of Colorado, the Colorado Coalition Against Domestic Violence, several school districts including Denver, Greeley and Aurora, and members of the Teen Parent Collaborative, Florence Crittenton Services negotiated for months with county officials, human service providers, and state legislators to draft a successful bill. We facilitated dialogues directly between teen parents—both mothers and fathers—and lawmakers at the state capitol to identify priorities and areas for compromise. We are especially grateful to Representatives Daniel Kagan (D) and Brian Del Grosso (R), and to Senators Owen Hill (R) and Larry Crowder (R) who sponsored the bill and worked tirelessly for its success. As a result of these efforts, HB 16-1227 was co-sponsored by an incredible 58 legislators, both Republican and Democrat, in a welcome demonstration of bipartisan cooperation. Additionally, 38 community organizations signed on in support. HB 16-1227 passed the House and the Senate of the Colorado General Assembly with 90 of 100 members voting yes. 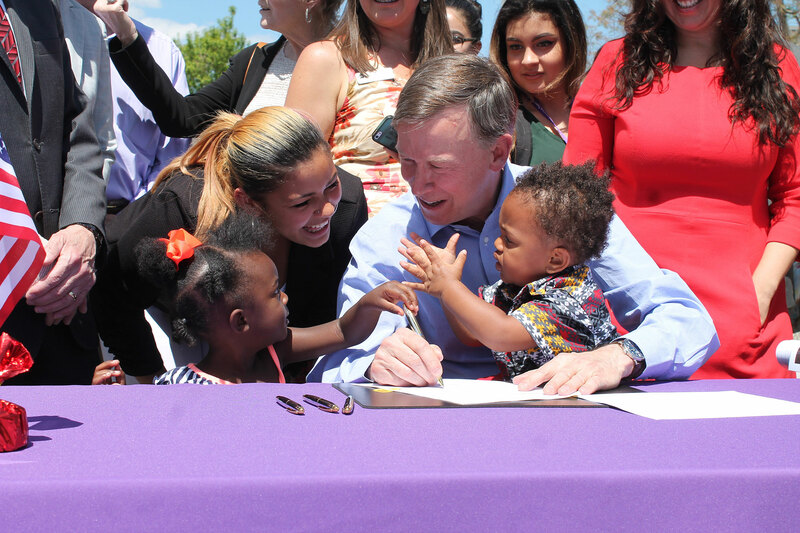 On May 19, 2016, Governor John Hickenlooper visited the Florence Crittenton Campus to sign HB 16-1227 into law and remove the child support requirement for teen parents and domestic abuse survivors. As a result, teen parents across the state of Colorado who are working towards a high school diploma can access CCCAP support without first pursuing child support through the legal system. With CCCAP support, their children can obtain a quality early childhood education center and become kindergarten-ready, and both mother and child can make education a priority to break the cycle of poverty.